Mario Cantin's Excogitations: Raising $ from VCs: Are you ‘unfundable’? 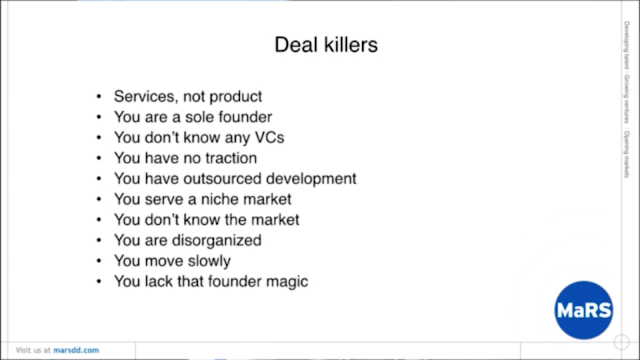 It explains the deal killers for VCs when getting pitched. It paints a realistic picture of where one stands. It provides a road map in order to address the situation, if one wishes to become fund-able. It came from a talk given at the MaRS Discovery District in Toronto by Michelle McBane. Michelle manages in under an hour to also explain the entire term sheet in a way that can be understood -- not a small feat. The direct link is https://vimeo.com/126259474. Raising money from venture capitalists - Entrepreneurship 101 2014/15 from MaRS Discovery District on Vimeo.